What is the current version and where I get it? The current version is 20090926, and you can get it here. New releases will always be published on this page. If you have the first version of the pack (20090829), you can download just the update. In this case, unpack it to the root of your SD Card and overwrite files if asked. Only the dinguxmb.cfg file and README.txt should be overwritten, so be aware that if you have created any shortcuts on your own, they will be lost. This pack includes no copyrighted game ROMs. Go find them yourself. For ease of organization, ROMs should be put on the respective folders under /local/roms (ex: /local/roms/genesis for Genesis ROMs, /local/roms/pce for PC-Engine, /local/roms/vcs for the Atari VCS/2600, etc). MAME4ALL is picky, so the ROMs should be put on /local/apps/mame4all/roms. Yes, 15 pictures from Wikimedia Commons (winners of the “Picture of the Year 2008” contest) and a song (Castlevania – Transylvanian Temptation OC ReMix) by Game Over, to showcase the multimedia capabilites of DinguXMB. Also, some MSX games: all of the games from Karoshi Corporation, The Cure by XL2S Entertainment, Universe Unknown by Infinite and Tetris 8K by Kralizec. All are homebrew, and most were created for the MSXDev development competition. 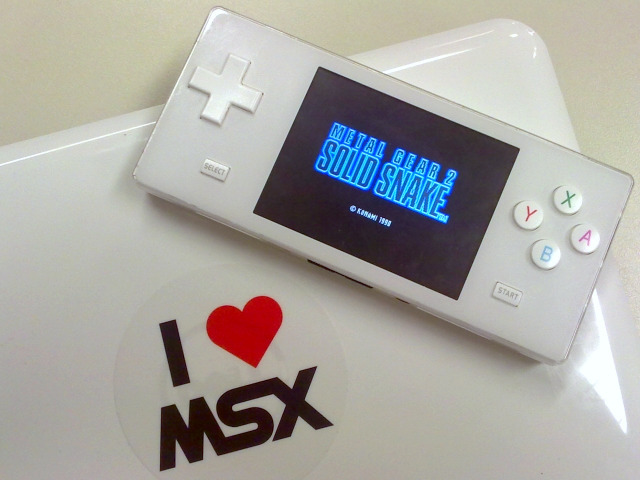 You can find all MSX Dev games here. Decompress the pack to the root of the SD card. After that, you will need to find a suitable kernel for your machine. On your Dingoo, load the original interface and go to System Set | System Setup | About and press up, right, down, up, right, down. You should see a white screen with some text. Look under LCD MODULE and take note of the numbers on that line, i.e. : ILI9331 or ILI9325. After that, put the card on your Dingoo and reboot. When you see the Dingux logo, hold select until you see the Linux penguin and some text on screen. Let go and enjoy. What? There’s no Dingux logo when you reset your Dingoo? Then you will need to run Booboo’s dual boot installer. Read the instructions and have fun. If your Dingoo gets “stuck” on the Dingux logo when you try to boot into Dingux, take out the miniSD card, format it on a Windows machine and copy the files again. I had this happen to me on cards formatted under Linux, even though they were formatted as FAT32. Why no <insert you favourite emulator/game here>? Probably because I didn’t have time to look into it, or it does not interest me. Of course, after the pack is “installed” you are free to add your own software. Will you add more games / emulators / <insert your favourite stuff here>? Probably, I already have some ideas. However, as I am extremely short on time, I make no promises. Also, currently I cannot fullfill requests. Where did those gorgeous game icons came from? The consoles came from a great set I found here. The MAME, Kobo and Tyrian logos were found on Google Images. Each icon is a 144 x 80 pixels PNG file with transparent background. However, to avoid overlapping the game names with the image, I limit the “usable area” of each icon to 120 x 80 pixels at max, with a transparent border 12 px wide on each side. This pack uses some files taken from the Dingux Quick Start Pack by Warpedflash (the Timidity patch set, the Timezone file, probably some other small stuff). Unless explicitely noticed, everything else is property of their respective authors. This pack is entirely free, no money should ever, under any excuses, be charged for it.